The official act of introducing a bill or resolution. The measure is given to the Chief Clerk or his or her representative at the Assembly Desk in the Assembly Chamber or to the Secretary of the Senate or his or her representative in the Senate Chamber. The measure then receives a number and becomes a public document available from the bill room (or at leginfo.legislature.ca.gov). Each proposed amendment to a measure also must be put across the desk in the Assembly or Senate in order to be considered for adoption. A bill passed by the Legislature and enacted into law. Termination of a meeting, occurring at the close of each legislative day upon the completion of business, with the hour and day of the next meeting being set prior to adjournment. Final adjournment of the Legislature; regular sessions of the Legislature, and any special session not previously adjourned, are adjourned sine die at midnight on November 30 of each even-numbered year. Proposal to change the text of a bill after it has been introduced. Amendments must be submitted to the Legislative Counsels for drafting or approval. Author amendments - Amendments proposed by the bill's author. Author's amendments to a bill may be adopted on the floor prior to the committee hearing on the bill with the committee chair's approval. Hostile amendments - Amendments proposed by another member and opposed by the author in a committee hearing or during Assembly or Senate Floor consideration. The Legislative Analyst's comprehensive examination of the Governor's budget, available to legislators and the public about six weeks after the Governor submits the budget to the Legislature. The amount of money made available for expenditure by a specific entity for a specific purpose, from the General Fund or other designated state fund or account. A limitation in the California Constitution on the maximum amount of tax proceeds that state or local government may appropriate in a fiscal year. The limit is based on 1986-87 fiscal year appropriations, and is adjusted annually. Signature of the Governor on a bill passed by the Legislature. Refers to both location and contents of public records kept by the Secretary of State, including copies of all measures considered at each session, journals, committee reports, and documents of historic value. The house of the California Legislature consisting of 80 members, elected from districts determined on the basis of population. Two Assembly districts are situated within each Senate district. A document prepared by a state agency, and submitted to the Department of Finance, to propose and document budget changes to support operations of the agency in the next fiscal year; used in preparing the Governor's budget. Refers to a legislature consisting of two houses (see Unicameral). A proposed law, introduced during a session for consideration by the Legislature, and identified numerically in order of presentation; also, a reference that may include joint and concurrent resolutions and constitutional amendments. A document prepared by committee and/or floor analysis staff prior to hearing the bill in that committee or on the floor of the Assembly or Senate. It explains how a bill would change current law and sometimes identifies major interest groups in support or opposition. The California Constitution grants the Governor "line item veto" authority to reduce or eliminate any item of appropriation in any bill including the Budget Bill. Years ago the Governor used an editor's blue pencil for the task. A bill authorizing the sale of state general obligation bonds to finance specified projects or activities. Subsequent to enactment, a general obligation bond bill must be approved by the voters. The Budget Bill after it has been enacted into law. The bill setting forth the spending proposal for the next fiscal year, containing the budget submitted to the Legislature by the Governor. The fiscal year addressed by a proposed budget, beginning July 1 and ending June 30. The cable television channels that televise agency meetings and Assembly and Senate proceedings. On motion from the floor to place a call of the house, the presiding officer directs the Sergeant-at-Arms to lock the chambers and bring in the absent Members (by arrest, if necessary) to vote on a measure under consideration. Action is not taken on an item under call until the call is lifted, at which time it must be immediately voted on. Order by the presiding officer directing the reading clerk to call the names of Members who have not responded to the roll call. Generally, expenditures to acquire or construct real property. Those members of the press who cover events in the Capitol. (1) A closed meeting of legislators of one's own party. (2) Any group of legislators who coalesce formally because of their common interest in specific issues. The current presiding officer, usually in the context of a committee hearing. The Assembly or Senate location where floor sessions are held. When a bill has been passed by the Legislature and enacted into law, the Secretary of State assigns the bill a "chapter number" such as "Chapter 123, Statutes of 1992," which is subsequently used to refer to the measure in place of the bill number. When, during a calendar year, two or more bills amend the same section of law and more than one of those bills becomes law, the bill enacted last (and therefore given a higher chapter number) becomes law and prevails over the bill or bills previously enacted (see Double Joint). Certain weekdays when legislators do not meet in formal legislative sessions, they are required to "check in" with the Chief Clerk of the Assembly or Secretary of the Senate. Mondays and Thursdays are ordinarily floor session days. Check-in days are typically Tuesdays and Wednesdays. An Assembly employee elected by Assembly Members at the beginning of every two-year session to serve as principal parliamentarian and record keeper of the Assembly. Responsible for all Assembly daily and weekly publications. A member of either house whose name is added to a bill as a coauthor by amending the bill, usually indicating support for the proposal. Bound volumes of law organized by subject matter. The code sections to be added, amended, or repealed by a bill are identified in the title of the bill. The Assembly or Senate meeting as a committee for the purpose of receiving information. An identical bill introduced in the other house. This procedure is far more common in Congress than in the California Legislature. The approval by the house of origin of a bill as amended in the other house. If the author is unwilling to move the bill as amended by the other house, the author requests "nonconcurrence" in the bill and asks for the formation of a conference committee. A measure introduced in one house that, if approved, must be sent to the other house for approval. The Governor's signature is not required. These measures usually involve the internal business of the Legislature. Members of a conference committee. The process whereby one or both houses approve the Governor's appointments to executive offices, departments, boards, and commissions. File containing bills that received no dissenting votes in committee. A person who resides within the district represented by a legislator. A resolution proposing a change to the California Constitution. It may be presented by the Legislature or by initiative, and is adopted upon voter approval at a statewide election. Ordinarily, a professional staff person who works for a legislative committee. Section in a bill indicating that it is to become operative only upon the enactment of another measure (to be distinguished from double jointing). To assemble a meeting. Each house of the Legislature usually convenes twice a week. Publication produced by each house for each day the house is in session. The publication provides information about bills to be considered at upcoming committee hearings and bills that are eligible for consideration during the next scheduled floor session. Pursuant to Joint Rule 62(a), any bill to be heard in committee must be noticed in the Daily File for four days, including weekend days. 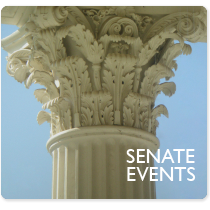 The Daily File also contains useful information about committee assignments and the legislative calendar. Produced by the Assembly and Senate respectively the day after a floor session. Contains roll call votes on bills heard in policy committees and bills considered on the floor, and other official action taken by the body. Any official messages from the Governor are also included. A Member may seek approval to publish a letter in the Journal on a specific legislative matter. At the end of a legislative session, the Journals are bound. The long desk in front of the presiding officer's rostrum where much of the clerical work of the body is conducted. Also, a generic term for the staff and offices of the Secretary of the Senate and the Chief Clerk of the Assembly. Statement by the presiding officer that there is no further business before the house. Prepared by the Legislative Counsel, it summarizes the effect of a proposed bill on current law. It appears on the first page of the printed bill. The area of the state represented by a legislator. Each district is determined by population and is designated by a number. There are 40 Senate districts and 80 Assembly districts. A bill that generally affects only the district of the Member of the Legislature who introduced the bill. Motion that, if adopted by a committee, moves a bill to the floor or to the next committee. Committee motion that a bill be passed with the recommendation that the floor adopt specified amendments. Amendments to a bill providing that the amended bill does not override the provisions of another bill, where both bills propose to amend the same section of law (see Chapter Out). Legislation recommended for referral to two policy committees for hearing rather than one. Both committees must approve the measure to keep it moving in the process. Typically used for sensitive subject areas that transcend the jurisdiction of one policy committee. Bill referrals are made by the Assembly and Senate Committees on Rules for their respective houses. Author has decided not to pursue the passage of the bill. The following phrase at the beginning of the text of each bill: "The people of the State of California do enact as follows." Whenever a bill passes both houses of the Legislature, it is ordered enrolled. In enrollment, the bill is again proofread for accuracy and then delivered to the Governor. The "enrolled bill" contains the complete text of the bill with the dates of passage certified by the Secretary of the Senate and the Chief Clerk of the Assembly. A resolution, when enrolled, is filed directly with the Secretary of State. (literally: out of or because of one's office) The act of holding one office by reason of holding another. For example, the Lieutenant Governor is, ex officio, a member of the Regents of the University of California. A committee meeting restricted to committee members and specifically invited persons. A motion by which an action taken in a floor session is deleted from the Daily Journal (for example, "Expunge the record"). A special legislative session called by the Governor by proclamation to address only those issues specified in the proclamation; also referred to as a special session. Measures introduced in these sessions are numbered chronologically with a lower case "x" after the number (for example, AB 28x). The number assigned to a measure in the Assembly or Senate Daily File. The file number changes each day as bills move on or off the Daily File. File numbers are assigned to measures on second and third reading; in conference; unfinished business (a bill amended in the other house and awaiting concurrence in amended form); and Governor's appointments. Legislation is taken up on the Assembly or Senate floor in chronological order according to file number. Items considered on the floor are ordinarily referred to by file number. Revisions to the Budget Bill proposed by the Department of Finance and addressed to appropriate committee chairs in the Assembly and Senate. Each bill introduced must be read three times before final passage. The first reading of a bill occurs when it is introduced. The Appropriations Committee in the Assembly and the Appropriations Committee in the Senate, to which each fiscal bill is referred upon approval by policy committee. If the fiscal committee approves a bill, it then moves to the floor. The date on the legislative calendar by which all bills with fiscal effect must have been taken up in a policy committee and referred to a fiscal committee. Any fiscal bill missing the deadline is considered "dead" unless it receives a rule waiver allowing further consideration. The 12-month period on which the state budget is planned, beginning July 1 and ending June 30 of the following year. The federal fiscal year begins October 1 and ends September 30 of the following year. (1) The Assembly or Senate Chamber. (2) The term used to describe the location of a bill or the type of session, connoting action to be taken by the house. Matters may be said to be "on the floor." The legislator responsible for taking up a measure on the floor. This is always the bill's author in the house of origin, and a Member of the other house designated by the author when the bill is considered by the other house. The name of the floor manager in the other house appears in parentheses after the author's name in the second or third reading section of the Daily File. A visitor may not observe the Assembly or Senate from the rear of the chamber without a floor pass. Assembly passes are issued by the Speaker's office; Senate passes are issued by the President pro Tempore's office. Passes are not required for the viewing area in the gallery above the chamber. As set forth in Joint Rule 62(a), the requirement that each bill in the first committee of reference be noticed in the Daily File for four days prior to the committee hearing at which it will be considered. At a second or subsequent committee of reference, a notice of only two days is required. Referring to the legislative rule requirement that an amendment to a bill be relevant to the subject matter of the bill as introduced. The Legislative Counsel may be asked to opine on germaneness, but the matter is subject to final determination by the full Assembly, or the Senate Committee on Rules. The spending plan submitted by the Governor in January for the next fiscal year (see Budget). When a preexisting situation is exempted from the requirements of a new law. The 3" x 5-3/4" hardbound edition of "California Legislature" published for each two-year legislative session. Contains indexed versions of the Assembly, Senate, and Joint Rules; biographies of members; and other useful information. Published by the Chief Clerk of the Assembly and Secretary of the Senate. A committee meeting convened for the purpose of gathering information on a subject or considering specific legislative measures. Status of a bill that fails to receive sufficient affirmative votes to pass out of committee. Adoption of amendments that delete the contents of a bill and insert provisions on a different subject (see Germaneness). May occur with or without the author's permission. The portion of the Daily File containing legislation that is ready for floor consideration, but, for a variety of reasons, is dormant. An author may move a bill to the inactive file, and move it off the inactive file at a later date. During the final weeks of the legislative session, measures may be moved there by the leadership as a method of encouraging authors to take up their bills promptly. A legislative proposal to change statutory law or the California Constitution, submitted directly by members of the public rather than by the Legislature, and requiring voter approval at a statewide election. To qualify for a statewide ballot, a statutory initiative must receive signatures equal to 5 percent, and a constitutional amendment initiative must receive signatures equal to 8 percent, of the votes for all candidates for Governor at the last gubernatorial election. The period of time between the end of a legislative year and the beginning of the next legislative year. The legislative year ends on August 31 in even-numbered years and in mid-September in odd-numbered years. The assignment of the subject matter of a bill to the appropriate committee for study during the period the Legislature is not in session. A resolution expressing the Legislature's opinion about a matter within the jurisdiction of the federal government, which is forwarded to Congress for its information. Requires the approval of both Assembly and Senate but does not require signature of the Governor. The Assembly and Senate meeting together, usually in the Assembly Chamber. The purpose ordinarily is to receive special information such as the Governor's State of the State address. The rules adopted by formal governmental action that govern our lives in various respects. A motion to temporarily postpone consideration of a matter before a committee or the house, such that the matter may later be brought up for consideration by a motion to "take from the table." An individual (commonly known as a lobbyist) engaged to present to legislators the views of a group or organization. The law requires formal registration with the Secretary of State if an individual's lobbying activity exceeds 25 contacts with decision makers in a two-month period. The Legislative Analyst, who is a legislative appointee, and his or her staff provide thorough, nonpartisan analysis of the budget submitted by the Governor; also analyze the fiscal impact of other legislation and prepare analyses of ballot measures published in the state ballot pamphlet. The Legislative Counsel (who is appointed jointly by both houses) and his or her legal staff are responsible for, among other things, drafting all bills and amendments, preparing the Digest for each bill, providing legal opinions, and representing the Legislature in legal proceedings. Department of the Office of Legislative Counsel that maintains the Legislative Information System, operates the database under which legislation is drafted and conveyed to the Office of State Publishing to be printed, and otherwise provides technological support to the Legislature. The President of the Senate, as so designated by the California Constitution, allowing him or her to preside over the Senate and cast a vote only in the event of a tie. If the Governor cannot assume his or her duties or is absent from the state, the Lieutenant Governor assumes that office for the remainder of the term or during the absence. Assembly Member or Senator who is an issues and political strategist for their respective majority party, second in command to the Assembly Speaker or Senate President Pro Tempore. Elected by the members of the Assembly or Senate's majority party. A vote of more than half of the legislative body considering a measure. Constituted by 41 votes in the Assembly, and by 21 votes in the Senate. One of the members of the majority party's leadership team in the Assembly or Senate; responsible for monitoring legislation and securing votes for legislation on the floor. The reference manual that governs matters of parliamentary procedure that are not covered by the Legislature's own written rules. Occurring in early May, the updated estimate of revenues and expenditures that replaces the estimates contained in the Governor's budget submitted in January. A bill, resolution, or constitutional amendment that is considered by the Legislature. The highest-ranking minority party post in each house; chief policy and political strategist for the minority party. One of the members of the minority party's leadership team in the Assembly or Senate; responsible for monitoring legislation and securing votes for legislation on the floor. An accurate record of the proceedings (see Daily Journal). A formal proposal for action made by a legislator during a committee hearing or floor session. A measure not having specified financial impact on the state and, therefore, not required to be heard in an Assembly or Senate fiscal committee as it moves through the legislative process. Nonfiscal bills are subject to different legislative calendar deadlines than fiscal bills. Those Members and employees of the Legislature who are elected by the membership of each house at the beginning of each session to perform specific functions on behalf of the house. Assembly officers include the Speaker, Speaker pro Tempore, Chief Clerk, and Sergeant-at-Arms. Senate officers include the President pro Tempore, Secretary of the Senate, and Sergeant-at-Arms. A roll call vote in a committee or an Assembly or Senate floor session that has occurred but has not yet been concluded or formally announced. Members may continue to vote or change their votes as long as a measure remains "on call." Calls are usually placed at the request of a bill's author in an effort to gain votes. Calls can be lifted by request any time during the committee hearing or floor session, but cannot be carried over into the next legislative day. A bill on the second or third reading file of the Assembly or Senate Daily File. A parliamentary ruling by the presiding officer of a committee or the house that a matter is not, at that time, appropriate for consideration by the body. A procedural question posed by a legislator during a committee hearing or floor session. A member must be recognized for this purpose and the question answered by the committee chair or presiding officer. A bill is taken up during a floor session by its author or floor manager according to its order in the Assembly or Senate Daily File. An author may choose to "pass on file," thus temporarily giving up his or her opportunity to take up a measure on the floor. Adoption of a measure by the Assembly or the Senate. (literally: per day) Daily living expense payment made to legislators when a house is in session. A formal request submitted to the Legislature by an individual or group of individuals. A request that the presiding officer remedy a breach of order or of the rules. Assertion by a Member that his or her rights, reputation, or conduct have been impugned, entitling the Member to repudiate the allegations. A motion to delay action on a matter before the house. (literally: for the time) Highest-ranking member of the Senate; also chairs the Senate Committee on Rules. Elected by Senators at the beginning of each two-year session. Managing the proceedings during a floor session. In the Assembly, the presiding officer can be the Speaker, Speaker pro Tempore, or any other Assembly Member appointed by the Speaker. In the Senate, the presiding officer can be the President, President pro Tempore, or any other Senator appointed by the President pro Tempore. A presentation of information to a group of reporters. Press conferences are frequently held in Room 1190 of the Capitol, the Governor's press room, which is available to Members on a reservation basis (445-4571). If a Member seeks to cut off all further debate on a measure, he or she may call the previous question to seek to compel the body to vote immediately on the issue. A Member who is so designated on a bill or other measure, indicating that the Member is a primary supporter of the measure. Permission given, by the presiding officer, to view the proceedings from the floor of the Chamber, rather than from the gallery. Members request that permission on behalf of constituents or other guests. A motion to delay action on a measure until a future date. A simple majority of the membership of a committee or the Assembly or Senate; the minimum number of legislators needed to begin conducting official business. The absence of a quorum is grounds for immediate adjournment of a committee hearing or floor session. Transmitting the message that members are needed to establish a quorum so that proceedings may begin. Presentation of a bill before the house by reading its number, author, and title. A bill is on either first, second, or third reading until it is passed by both houses. Revising the allocation of congressional seats based on census results. Also used to refer to redistricting (the revision of legislative district boundaries) to reflect census results. (1) An official pause in a committee hearing or floor session that halts the proceedings for a period of time but does not have the finality of adjournment. (2) A break of more than four days in the regular session schedule such as the "Easter recess." A motion giving the opportunity to take another vote on a matter previously decided in a committee hearing or floor session. The method, used by members of the public, by which a measure adopted by the Legislature may be submitted to the electorate for a vote. A referendum petition must be signed by electors equal in number to 5 percent of the votes for all candidates for Governor at the last gubernatorial election. A motion to revoke an action previously taken. See Concurrent Resolution and Joint Resolution. Recording the vote of each member of a committee or of the full Assembly or Senate. Committee roll calls are conducted by the committee secretary, who calls each member's name in alphabetical order with the name of the chair called last. Assembly roll calls are conducted electronically, with each Member pushing a button from his or her assigned seat. Senate roll calls are conducted by the Reading Clerk, who reads each Senator's name in alphabetical order. Exemption to the Assembly, Senate, or Joint Rules, for which formal permission must be granted. Principles formally adopted to govern the operation of either or both houses. These include Standing Rules of the Assembly, Standing Rules of the Senate, and Joint Rules of the Senate and Assembly. Each bill introduced must be read three times before final passage. Second reading occurs after a bill has been reported to the floor from committee. The portion of the Daily File that lists measures that have been reported out of committee. Measures stay on the second reading file for one legislative day before moving to the third reading portion of the File. A Senate employee serving as principal parliamentarian and record keeper for the Senate, elected by Senators at the beginning of each two-year session. The Senate Secretary and his or her staff are responsible for publishing the Senate daily and weekly publications. Ordinarily, a portion of the California Codes or other statutory law; alternatively, a portion of the text of a bill. The text of code sections is set forth in bills as proposed to be amended, repealed, or added. The house of the California Legislature consisting of 40 members elected from districts apportioned on the basis of population, one-half of whom are elected or re-elected every two years for four-year terms. Employee responsible for maintaining order and providing security for the Legislature. The Chief Sergeant-at-Arms in each house is elected by the Members of that house at the beginning of every legislative session. The period during which the Legislature meets. The Legislature may meet in either regular or special (extraordinary) session. A hearing of a committee attended by less than a quorum of the members of the committee. The presiding officer of the Assembly, elected by the membership of the Assembly at the beginning of the two-year session. This is the highest-ranking Member of the Assembly. Member, appointed to this office by the Speaker, who presides over a floor session of the Assembly at the request of the Speaker. Occasionally a bill is of such importance that advance notice is given as to when it will be considered by the Assembly or Senate. Notice is given during a floor session by requesting unanimous consent to set the bill as a special order of business on a specific date and time. This assures adequate time for debate and allows all Members the opportunity to be present. The Member of the Legislature, private individual, or group who develops a measure and advocates its passage. A bill that proposes nonsubstantive amendments to a code section in a particular subject; introduced to assure that a bill will be available, subsequent to the deadline to introduce bills, for revision by amendments that are germane to the subject of the bill. Head of the Bureau of State Audits, which conducts financial and performance audits of the state and local government agencies at the request of the Joint Legislative Audit Committee. State legislative enactment or administrative regulation that mandates a new program or higher level of service on the part of a local government, the costs of which are required by the California Constitution to be reimbursed. Enacted bills, which are chaptered by the Secretary of State in the order in which they become law. A subgroup of a full committee, appointed to perform work on one or more functions of the committee. Digests of each bill enacted in a two-year session, as prepared and compiled by the Legislative Counsel. The measures are listed by chapter number, reflecting the order in which they were signed into law. A motion to waive requirements that the California Constitution imposes, but permits to be waived in a specified manner. A motion to suspend requires an extraordinary vote. Any bill that imposes, repeals, or materially alters a state tax. The Legislative Counsel indicates in the title and Digest of the bill whether the bill is a tax levy. Collective reference to lobbyists (see Legislative Advocates). Each bill introduced must be read three times before final passage. Third reading occurs when the measure is about to be taken up on the floor of either house for final passage. A summary of a measure that is ready for floor consideration. Describes most recent amendments and contains information regarding how Members voted on the measure when it was heard in committee. Senate floor analyses also list support or opposition by interest groups and government agencies. That portion of the Daily File listing the bills that are ready to be taken up for final passage. In the Assembly, 54; in the Senate, 27. Required, for example, for urgency measures and most measures making appropriations from the General Fund. The consent of all of those Members present, ordinarily presumed to exist in the absence of objection. That portion of the Daily File that contains measures awaiting Senate or Assembly concurrence in amendments adopted by the other house. Also contains measures vetoed by the Governor for a 60-day period after the veto or Governor's Appointments for confirmation. A legislature consisting of one house (Nebraska has the only unicameral state legislature). Section of a bill stating that the bill will take effect immediately upon enactment. A vote on the urgency clause, requiring a two-thirds vote in each house, must precede a vote on the bill. A bill affecting the public peace, health, or safety, containing an urgency clause, and requiring a two-thirds vote for passage. An urgency bill becomes effective immediately upon enactment. The Governor's formal rejection of a measure passed by the Legislature. The Governor may also exercise a line item veto, whereby the amount of an appropriation is reduced or eliminated, while the rest of the bill is approved (see Blue Pencil). A veto may be overridden by a two-thirds vote in each house. A vote that requires only an oral "aye" or "no," with no official count taken. The presiding officer determines whether the "ayes" or "noes" carry.